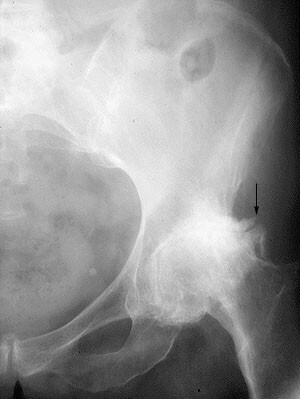 This is an image of DJD or OA of the hip which should be differentiated from Rheumatoid Arthritis (RA). Note the joint space is almost completely obliterated. There is still a hint of joint space medially but the superior portion is completely destroyed. The supralateral aspects are going to be affected most because the weight is transfered through the roof of the acetabulum. Note the sclerosis and oseophyte formation (arrow).